PICTURES FROM THE SET OF "HTNGU"
SHOOTING HTNGU MUSIC VIDEO TODAY! Having fun at the #HTNGU shoot right now.Can't wait for you all to see it. Single's out Tuesday!" How catchy does this chorus sound??!?!?! Epic Records released a clip of the chorus of "Here's To Never Growing Up" and miss Avril has another huge hit on her hands! What do you think? Do you see yourself in the lyric video preview? 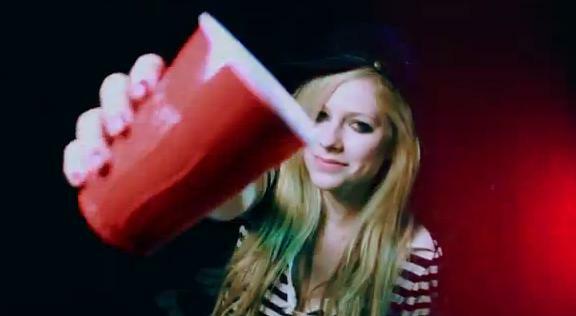 "We'll be running down the street yellin' "Kiss my -", I'm like "yeah whatever we're still living like that", when the sun's going down we’ll be raising our cups, singing, here’s to never growing up"
This song is reminding me of Avril's appearance in Rihanna's "Cheers" video! Remember, you must live in Southern California to enter. For all my fans!! Here's your chance to meet me! Check out avril-lavignes-biggestfan.com and tell VEVO why we have to meet! Avril tweeted this message with lyrics from the song! EEK I'M SUPER EXCITED! Then, every day, tweet your picture, story, and opinion on the daily topic. For example, today is April 3, so that is the "Favorite Avril Album" day. I tweeted how I love Let Go. Tomorrow is "Favorite Kid Photo" so we then need to post something related to that (I guess it can be Avril or related to you personally). Every day there is a new task. "HERE'S TO NEVER GROWING UP" SINGLE COVER! Is anyone else's jaw on the floor right now? WOWZA!!! Avril looks smokin hot on the cover of her new single, "Here's To Never Growing Up". With the smeared eye makeup and the HUGE teddy bear covering her, umm, assets, Avril is definitely all grown up! Do you think this image will reflect the direction of the new album/her image?